The sixth mass extinction is underway, this time caused by humans. A team of researchers have calculated that species are dying out so quickly that nature's built-in defense mechanism, evolution, cannot keep up. If current conservation efforts are not improved, so many mammal species will become extinct during the next five decades that nature will need 3-5 million years to recover to current biodiversity levels. And that's a best-case scenario. An illustration of how the smaller mammals will have to evolve and diversify over the next 3-5 million years to make up for the loss of the large mammals. We humans are exterminating animal and plant species so quickly that nature's built-in defence mechanism, evolution, cannot keep up. An Aarhus-led research team calculated that if current conservation efforts are not improved, so many mammal species will become extinct during the next five decades that nature will need 3-5 million years to recover. There have been five upheavals over the past 450 million years when the environment on our planet has changed so dramatically that the majority of Earth's plant and animal species became extinct. After each mass extinction, evolution has slowly filled in the gaps with new species. The sixth mass extinction is happening now, but this time the extinctions are not being caused by natural disasters; they are the work of humans. A team of researchers from Aarhus University and the University of Gothenburg has calculated that the extinctions are moving too rapidly for evolution to keep up. If mammals diversify at their normal rates, it will still take them 5-7 million years to restore biodiversity to its level before modern humans evolved, and 3-5 million years just to reach current biodiversity levels, according to the analysis, which was published recently in the scientific journal, PNAS. "There are hundreds of species of shrew, so they can weather a few extinctions. There were only four species of sabre-toothed tiger; they all went extinct." Long waits for replacement rhinos Regenerating 2.5 billion years of evolutionary history is hard enough, but today's mammals are also facing increasing rates of extinction. Critically endangered species such as the black rhino are at high risk of becoming extinct within the next 50 years. Asian elephants, one of only two surviving species of a once mighty mammalian order that included mammoths and mastodons, have less than a 33 percent chance of surviving past this century. The researchers incorporated these expected extinctions in their calculations of lost evolutionary history and asked themselves: Can existing mammals naturally regenerate this lost biodiversity? Using powerful computers, advanced evolutionary simulations and comprehensive data about evolutionary relationships and body sizes of existing and extinct mammals, the researchers were able to quantify how much evolutionary time would be lost from past and potential future extinctions as well as how long recovery would take. The researchers came up with a best-case scenario of the future, where humans have stopped destroying habitats and eradicating species, reducing extinction rates to the low background levels seen in fossils. 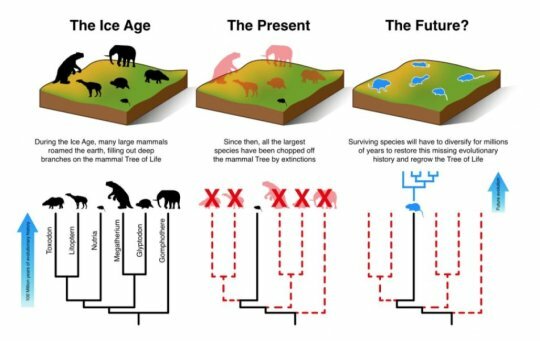 However, even with this overly optimistic scenario, it will take mammals 3-5 million years just to diversify enough to regenerate the branches of the evolutionary tree that they are expected to lose over the next 50 years. It will take more than 5 million years to regenerate what was lost from giant Ice Age species. Prioritizing conservation work "Although we once lived in a world of giants: giant beavers, giant armadillos, giant deer, etc., we now live in a world that is becoming increasingly impoverished of large wild mammalian species. The few remaining giants, such as rhinos and elephants, are in danger of being wiped out very rapidly," says Professor Jens-Christian Svenning from Aarhus University, who heads a large research program on megafauna, which includes the study. The research team doesn't have only bad news, however. Their data and methods could be used to quickly identify endangered, evolutionarily distinct species, so that we can prioritise conservation efforts, and focus on avoiding the most serious extinctions. As Matt Davis says: "It is much easier to save biodiversity now than to re-evolve it later."